Nuremberg has a new hero! In beautiful weather, Sam Pilgrim (GBR) delivered a run that is unprecedented in freeride history. The British rider won first place at the final event of the Freeride Mountain Bike World Tour with over four points ahead of Martin Soderstrom (SWE) and over six ahead of Brandon Semenuk (CAN). Trick after trick, the 12 riders who qualified for the final of the FMB World Tour Diamond Event raised the bar of the sport; you just don’t see tricks of these dimensions everyday. Anyone who did not make it to Nuremberg can watch the repeat of the webcast this coming Monday at 10am CET on www.redbulldistrictride.com to witness the sensational performance of mountain bike freeriding’s cream of the crop. 24 riders from 10 nations, a course of about 1km in length and 75.000 spectators over the weekend: that was the recipe in Nuremberg for an event that could not have been more spectacular. The spectators had arrived in droves and duly celebrated their superstars creating the perfect atmosphere during the entire contest in the historical centre of Nuremberg. When Sam Pilgrim took off from the obstacles, all of Nuremberg held its breath because no other rider had ever delivered such a performance. At every hit he showed another trick and convinced the jury with his consistently high level of tricks throughout the overall 6 Districts. It was plain to see that he was thoroughly enjoying the course: “The first time I saw the course, I couldn’t wait to just go crazy on it. Of course I’m really stoked I won but more importantly, I had a lot of fun. 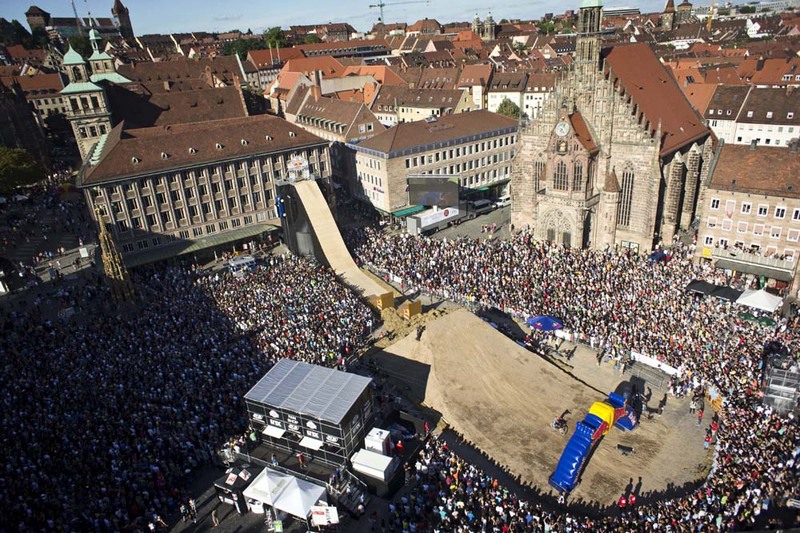 Nuremberg is just a really cool city!” The best fit for him was obviously the Ramp District, where he could really show off his skills – for example a totally stylish flair on the small quarter. Canadian Brandon Semenuk already knew ahead of the Diamond event and final of the FMB World Tour that he is the new FMB World Tour Champion. While other riders may have leaned back and relaxed, Brandon went really big in Nuremberg. He almost achieved a perfect season with every event that counted towards his overall World Tour Ranking being a first place. Because of a crash in the Best Trick District he only came in third in Nuremberg making him miss that opportunity. Brandon was stoked anyway: “This event was the highlight of the season! So many people who really created a great atmosphere and a really sick course – it was exactly my thing!” The fact that the course offered many different facets of mountain biking really worked in his favour since he was able to show how versatile he really is – whether in the extremely technical Ramp District or the massive 8 meter high drop off the castle wall. The youngest rider in Nuremberg was by far Anthony Messere, who delivered an absolutely impressive performance. Especially the double backflip over the 50ft gap in the Best Trick Distance blew the judges away and made him an absolute audience favourite. In the end, he settled for 7th place; a truly solid position in such a high profile riding field. His rank at the Red Bull District Ride also secured him 4th place in the 2011 FMB World Tour just missing the podium. The comeback of the most legendary urban freeride event in mountain bike history – the Red Bull District Ride had already visited in 2005 and 2006 – can definitely be considered a worthy finish of the World Tour.